Adorable New England charmer! Set back from the road behind a historic stone wall, this 3 bedroom home personifies warmth and character. Built in 1940, its 1980 addition of a magnificent great room is perfect for today's households. You'll spend hours by the cozy fireplace and a wall of built-in shelving offers the perfect space to display collections of books, glass, or whatever is dear to you. That wall opens to the eat-in kitchen and the glass enclosed sun room with sliders to a covered deck and a stone terrace. A separate main floor room with fireplace serves either as dining or living room: your choice. The second floor features a master bedroom with vaulted ceiling and beams from which you have one of the most spectacular views in all of Redding! Moon and sun rises observed right from your MBR will become a treasured part of your day at 28 Cross Highway. A second bedroom and spacious hall bath complete the upstairs. The ML and UL wood floors have all been recently refinished. The third bedroom is on the lower level as is an office/study/playrm w/French doors to the back yard. 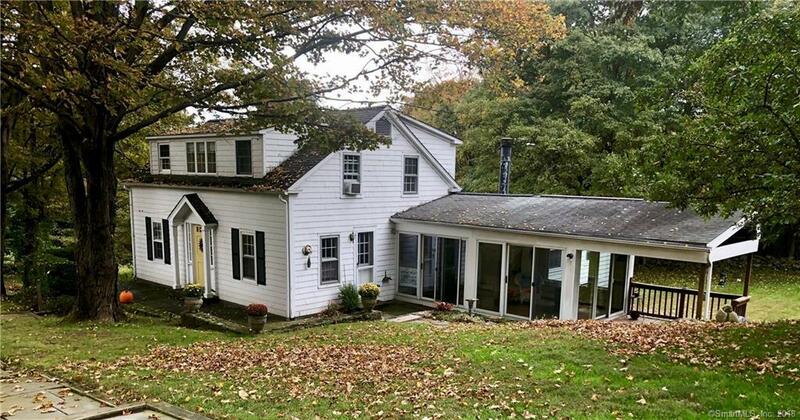 4-BR septic allows for both LL rooms to be used as bedrooms OR for add'n to house.The property is picture-perfect: level & sloping lawn with beautiful vistas. Detached garage. Uber convenient location, this home is just 56 miles from NYC in an idyllic Redding Center setting, just steps from the Redding Green on a designated scenic road. Special financing avail: No loan fees. See flyer at property. Directions: Cross Highway, Directly Across The Street From The Congregational Church. Selling Office: G. Stanton Properties, Inc.